The first of the season's strawberries appeared at the farmers' market last week! 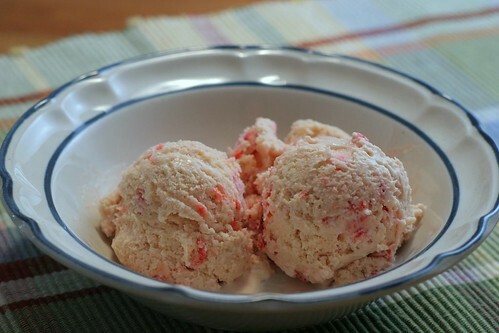 They would have been delicious on their own, but I was having a craving for a frozen dessert so I decided to make strawberry ice cream. Strawberry is not usually among my top choices for ice cream flavors but I had a feeling it would be really really good with these fresh strawberries, and it was. I used the recipe from The New Best Recipe, which is a bit complicated, but the cookbook has great explanations for how each step of the recipe was tested and decided upon - with the recipes in this book, I trust that the details really do make the final product better. Anyway, enough talk. Go make some ice cream! Toss the strawberries with a pinch of salt and 1/2 cup of the sugar in a medium saucepan. Mash berries gently with a large fork or potato masher until slightly broken down. Let stand until sugar is dissolved and berries have released their juices, stirring occasionally, about 30-40 minutes. Meanwhile, place a strainer over a medium bowl set inside a large bowl containing ice water. Heat the milk, cream, 1/2 cup of the sugar, and a pinch of salt in a medium saucepan over medium heat, stirring occasionally, until steam appears and mixture reaches about 175 deg F, about 5 minutes. While milk mixture is warming, whisk yolks and remaining 1/4 cup sugar in a medium bowl until well combined. Slowly whisk about half of the warm milk mixture into the yolks, 1/2 cup at a time. Slowly whisk milk-yolk mixture into the warm milk in the sauce pan. Over medium heat, cook milk-yolk mixture, stirring constantly with a wooden spoon, until foam subsides and steam appears, or mixture reaches 180-185 deg F. Be careful not to boil the mixture. Strain custard into the bowl set in the ice-water bath and cool custard to room temperature. Stirring occasionally will help the mixture cool. While custard is cooling, set the saucepan with the berries in it over medium-high heat and bring to a simmer. Stir occasionally, until berries are softened, about 5 minutes total. Strain berries, reserving juices. Place berries in a small bowl and mix in the lemon juice and vodka. Cover berries with plastic wrap, cool to room temperature, and then refrigerate. Stir reserved strawberry juices and vanilla extract into the room temperature custard, then cover the bowl with plastic wrap and refrigerate. Custard and berries should be refrigerated anywhere from 3-24 hours. Freeze ice cream in ice cream maker according to manufacturer's instructions until ice cream reaches a soft-serve texture. Add the strawberries and churn for 1-2 more minutes, until berries are fully incorporated. Transfer ice cream to an airtight container and freeze until firm, at least 2 hours.